A newborn false killer whale swims with its mother soon after it's born off the coast of Dana Point, Calif.
DANA POINT, Calif. -- An amazing and rare sight of a whale birth was caught on camera off the coast of Dana Point. In footage captured from a catamaran operated by Captain Dave's Dolphin and Whale Safari, a false killer whale is seen giving birth alongside a whale watching boat. 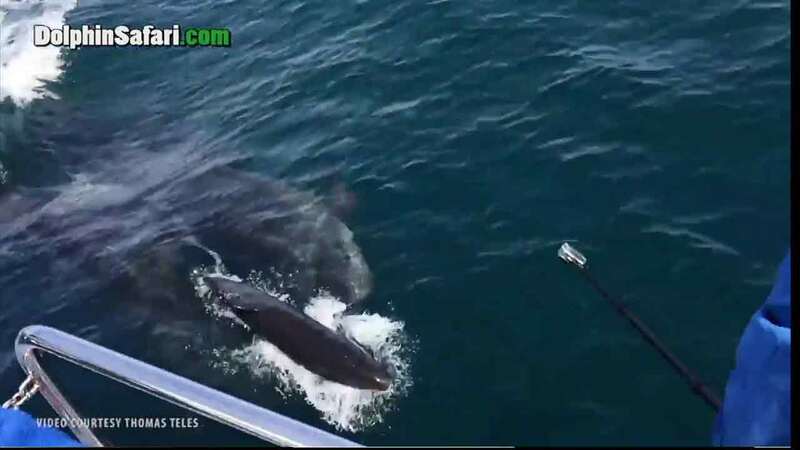 The striking scene happened Saturday as a pod of about 20 whales came up to the boat and pushed against it, according to a press release from the company. There is a sudden burst of blood and then a newborn calf pops out. The pod is then seen taking turns pushing the calf to the surface until the newborn was able to swim on its own. False killer whales are rarely seen off of Southern California and are normally found in warmer waters, according to the release. Capt. Dave stated that the last time he witnessed one was two years ago; before that, it had been nearly 10 years. "What a once in a lifetime thing to see!" said Capt. Dave in the release. "In over twenty years on the water I have never seen anything like that."